"Begin first to love yourself, and you will know how to love others." Born into a poor rural setting in the Northern part of the Philippines, Alex grew up in a family devoted to spiritual healing and mediumship. Both his parents earned a modest living as farmers while they were also involved in the Union Espiritistas, thereby invoking the Holy Spirit when treating people in the neighbourhood. In this environment of prayer and healing, most of his brothers and sisters eventually became healers. Alex, was the youngest of his family and started his healing mission at the age of 14 through a premonitory dream of a paralized elder who could walk again after he treated her. From a young age he became well-known as a healer in the Philippines and abroad and was sought after by many patients as well as doctors and scientists. However, at the age of 18, he felt it was time to explore the world outside of his village and he wanted to escape from the long lines of people who waited every day for his healing. So he left his village and changed his name to Josef Viloria. He wandered around the northern parts of the Philippines for three years, accepting many different jobs and assignments to make a living. In this period, his health deteriorated gradually until he couldn't walk any more, while he kept hearing a voice urging him to continue his healing ministry. At the age of 21, he finally returned back home to his family and his first patient turned out to be his mother, who had had a mental breakdown due to anxiety and worry about his absence. From this moment onwards, Alex Orbito started to dedicate himself entirely to his healing mission and as such he eventually became one of the most sought-after healers in the Philippines and beyond. In the Seventies, many different scientific groups came to visit him and eventually invited him to come abroad, thus helping both patients as well as scientists in opening up new horizons in the field of self-healing. The actress and author, Shirley Maclaine witnessed his healings over several years and described her personal experiences in her best-selling book, 'Going Within', which made him even more well-known across the world. In his life, he has travelled to more than 60 countries around the world, treating the poor and the rich, the known and the unknown. Despite facing disbelief and scepticism, Alex Orbito has now, for nearly five decades, worked patiently and persistently to increase awareness of spiritual healing in the Philippines and around the world. Having laid hands on millions of ailing people, a large majority who proclaim the efficacy of his cures, he is always quick to disclaim personal praise, saying that he is only an instrument of Divine powers. Time and again, Alex Orbito has willingly cooperated with numerous laboratory investigations and has often subjected to rigid scientific testing to determine the source and extent of his healing powers (see below). Research done in Sweden, Germany, Austria, France, Canada, Japan and the Philippines has confirmed his extraordinary healing gifts and been verified by several leading researchers including: German physicist and chemist, Alfred Stelter Ph.D; American biochemist, Dr. Donald G. Westerbeke; Dutch neurologist, Jan van Hemert Ph.D, Founder of the first European University of Holistic Medicine; Canadian, Dr. Lee Pulos Ph.D; and Japanese researcher, Dr. Kenzo Yamamoto. More than 20 books have been written exclusively, or partly, about Alex and his healing mission, and these are listed below. 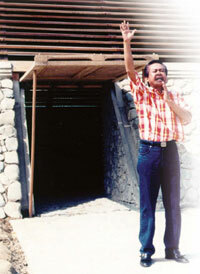 Apart from his work as a healer, Alex founded the Philippine Healers' Circle Association in 1983, for which he has been elected President for Life, and also the Spiritual Help Foundation, which provides scholarships and finances community centers and schools in the areas of Cuyapo and Pangasinan in the Phillipines. In 1999, Alex inaugurated the Pyramid of Asia where international healing seminars and gatherings are held to facilitate learning, exchange and personal growth. In 1985 he received an Honorary Doctorate from the UN World Brotherhood Congress as an"outstanding and dedicated Envoy for Universal Peace, Goodwill and Understanding". He was also made a recipient, in 2000, of the prestigious Filipino Jose Rizal Award for his humanitarian works in the Philippines and abroad. Below is a small summary of the several documentaries which were broadcasted on several national TV stations, mostly in the past decade. The list is far from complete since Alex Orbito does not recall the many different journalists and TV stations who made documentaries about him and his healing work. It is known that he was always open and willing to talk with the press and media and willingly allowed the filming of healings (after obtaining the patient's consent), showing the audience that there is nothing to hide. "Philippine Healers" by Harvey Martin (USA) and more. Note: Particularly, the recently made documentary "Faith Healing" by the Swiss antropoligist Jean-Dominique Michel gives a comprehensive and objective overview of Alex Orbito's life and work at home and abroad. Note: For those interested to purchase a book from above literature list, we recommend to order the books through internet or through dedicated websites. Please note that some books are only available in one particular language. In the course of his life, Alex Orbito was often asked to undergo and assist in scientific studies to further research, measure and understand the phenomena of barehanded or psychic surgery. To view the long list of scientific studies he underwent and to know the results of the recent extensive studies done by Dr. Jan van Hemert Ph.D in order to measure the effectiveness of his healings, click here. Spiritual healing and in particular psychic surgery has always created heated debates and discussions due to its spectacular nature and materializations, which cannot be explained by present science. Many extensive studies (see chapter scientific studies and research) performed on Alex Orbito and the patients have shown time and again that the phenomena truly exists and that a high percentage of people found improvement and in some cases complete cure after being treated. Alex Orbito was always willing to subject himself to scientific studies and research so that science could advance in its metaphysic and holistic approach and numerous scientists as well as media people filmed, documented and studied him and his work in a profound manner. Since this type of healing places several question marks at the roots of our modern medicine, Alex was often faced with challenges and accusations of fraud or the illegal practice of medicine. In 2003 in Italy, he twice offered the court the possibility to perform psychic surgery in front of the judges on their terms and conditions to give proof to the authenticity of his healing gifts. The offer was declined on both occasions. This leads us to the question if - as a modern society - we are genuinely prepared to accept the unknown and explore new realms of life or alternatively choose to close our eyes and reject the new. The famous philosopher Carl Gustav Jung once said in front of a large audience in New York "I shall not commit the fashionable mistake of declaring everything I cannot explain as a fraud". In the year 2005, he was again accused in Toronto, Canada, although the Crown was eventually obliged to drop all charges in lack of any evidence. Enclosed your will find the Public Press Release of the reputable lawfirm Ruby & Edwardh in Toronto, clearing him from further accusition. Alex Orbito himself is very aware that psychic surgery or spiritual healing creates many challenges to the rational pre-conceived mind sets in modern society. Having subjected himself time and again to scientific researches and studies worldwide, he eventually learned that closed (ie. fearful) minds can not be "convinced" of new acknowledgements and discoveries in this respect. It takes an open and objective mind as well as courage to acknowledge that the roots of our present deterministic way of thinking is (too) limiting. Fortunately, the group of scientists, doctors and therapists who embrace new, open and objective views towards a more holistic form of health are quickly growing in numbers. In the midst of all this turmoil, Alex Orbito simply states: "My mission is not to convince, but to cure".